Aniplex of America Samurai Flamenco 06/20/2013 ??? Aniplex of America Day Break Illusion 06/27/2013 ??? Sentai Filmworks Tribe Cool Crew 10/09/2014 ??? Last edited by WTK; 04-14-19 at 05:50 PM. Last edited by WTK; 04-29-17 at 01:47 AM. ONLY YESTERDAY (1991, aka OMOIDE PORO PORO) is one of the finest animated dramas ever made. TCM showed it once and did a very poor job of promoting it. It needs to be out there. Why is Disney sitting on it? Ikki-Tousen: Dragon Destiny is finally getting release by Media Blasters. It was licensed back in 07/02/2007. Any future word on Monster? My girlfriend gushes over it. I'd rather support a non-bootleg or not torrent version so I've been holding out hope for it. It's supposed to be coming 12/8/09. The SRP is $59.90. Barring any major changes, expect a total of 5 boxsets to cover the entire series. 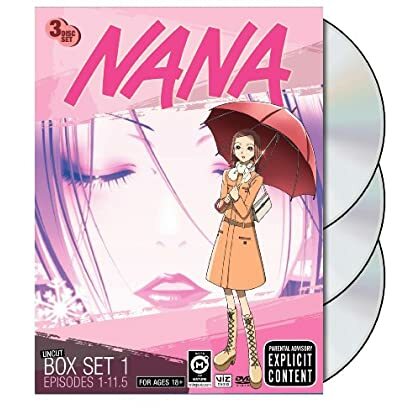 Has anyone ever licensed the NANA anime series? The live-action movies are out, the manga is out...where's the anime?! Boxset 1 just got released today. Boxset 2 is to be released on 11/24/09. Boxset 3 won't be released until sometime in 2010. P.S. : I bought my copy today (Wed. 9/9). A little pricey ($49.99 at Best Buy), but it's something I really wanted. I watched the first episode and it's great. Last edited by Ash Ketchum; 09-09-09 at 08:27 PM. The Fist TV series will be released in 4 boxsets. MB will be dubbing both properties. The plan is to start releasing these series sometime in summer of 2010. I am HUGELY surprised that both Queen's Blade series got picked up for 2010 release by Media Blasters. If there is any series that takes fanservice to totally ridiculous levels, this is it. Now, any news on official licensing of the two Rosario + Vampire TV series? No news on this. Viz Media has the manga, so maybe they still have the inside track on this. It's hard to say if anyone would license this. The manga has been fairly popular (Viz has translated and released all ten of the collected volumes of the original manga that appeared in Monthly Shounen Jump), and I wouldn't be surprised that they release the two Rosario + Vampire TV series on the Shounen Jump Advanced label. Last edited by WTK; 11-22-09 at 01:27 AM. FUNimation Entertainment will release all six OVA'S on one DVD set and on Blu-ray disc in late 2010. For more information about the series, please visit http://www.funimation.com/flcl. Last edited by WTK; 01-07-10 at 04:07 PM. For more information about the series, please visit http://www.funimation.com/martialhearts. FUNimation Entertainment will release the entire series in one DVD set in Spring 2011. For more information about the series, please visit http://www.funimation.com/herotales. FUNimation Entertainment will release the series on DVD in half season sets in Fall 2010. FUNimation Entertainment will release the series on DVD in two parts starting in late 2010. For more information about the series, please visit http://www.funimation.com/sacredblacksmith. FUNimation Entertainment will release the entire series on DVD in one set in Fall 2010. What is the deal with Crusher Joe? With Animeigo no longer putting it out, the used price is just to dang high. My Laserdisc player finally gave out, so I no longer have the ability to watch this. The North American anime distributor Bandai Entertainment has posted a new video on its ASOS Brigade website, the official unofficial site for the Haruhi Suzumiya franchise. In the "Episode 0.8888" video, which is also posted on Bandai Entertainment's Youtube channel and in this article below, the producer of the English version of The Melancholy of Haruhi Suzumiya said that "the contract has been signed," and added that he's going to "shoot a series of videos to promote the second season DVDs." When voice actress Cristina Vee asked if she can have a part in the English voice cast for the second season, the producer replied, "we'll see about that, you'll have to audition first." Vee also sang an English version of "Super Driver," the opening theme song to the second season of The Melancholy of Haruhi Suzumiya, in the video. However, when fellow ASOS Brigade member Karrie Shirou asked when the DVDs are to be released, the video feed encountered "technical difficulties" during the producer's answer.